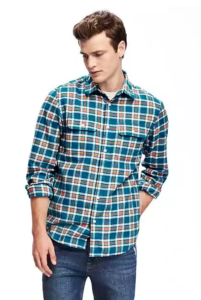 Old Navy offers its Old Navy Men's Regular-Fit Plaid Flannel Pocket Shirt in Apricot , Robbie Red, or Navy Stripe for $9.99. Use coupon code "HUGE" to drop the price to $6.49. Plus, coupon code "FREESHIP" gets free shipping. That's an all-time low! It's available sizes XS to L, but not in all size/color combinations. Deal ends February 20.